March 27th, 13 degrees at 8:00am. 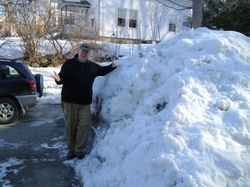 I'm over 6-feet tall and that snow pile has well over a foot on me! I'm thinking an early date in May is a good guess for when the last of it finally melts.